Often simple truly is best when it comes to skincare. Especially if you have sensitive skin! Whenever my skin acts up (either with breaking out or with irritation), I often have to just cut back on my products and streamline to use the most simple routine or products with few ingredients. Own Skin Health is a cruelty-free brand with a new and fresh approach to skincare. This San Francisco-based brand believes that clinically proven and good-for-you skincare is the key to healthy skin. You will not find any harsh chemicals in Own Skincare. Just gentle and scientifically proven ingredients that work! I tried out two products from the Own Skin Health skin care range: Own Lifting Eye Cream and the Own Silk Concentrate. To find out more about how I like these products, please click "read more" below! I completely adore this eye cream. It is both gentle and soothing (Just be sure to keep from getting it in your eyes or your eyes will sting and tear). It was formulated to brighten skin while firming and hydrating. I just love the feel of this product. Like all Own Skin Health products, this eye cream is formulated with their patented CLA (Conjugated Linoleic Acid). This Own Lifting Eye Cream has not only smoothed and hydrated my eye area, but also it has really lightened my dark circles! I am quite amazed actually! My eye areas looks great after using this product for a few weeks (morning and night). My fine lines seem to be smoothed as it has plumped my skin. 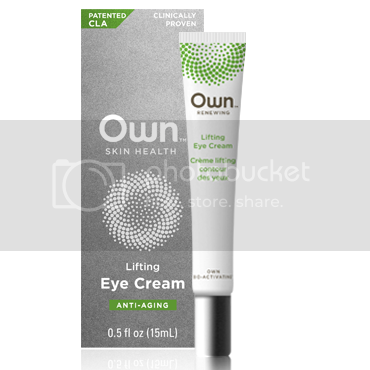 Own Lifting Eye Cream retails for $23.99. Here is the ingredients list: Water, Caprylic/ Capric Triglyceride, Carthamus Tinctorius (Safflower) Oleosomes, Glycerin, Glyceryl Stearate, Stearic Acid, Conjugated Linoleic Acid*, Dimethicone, Cetearyl Olivate, Butyrospermum Parkii (Shea) Butter, Coco-Caprylate, Cetearyl Glucoside, Tocopherol, Coco-Glucoside, Glyceryl Oleate, Cetearyl Alcohol, Sorbitan Olivate, Glycine Soja (Soybean) Germ Extract, Magnesium Ascorbyl Phosphate, Potassium Sorbate, Xanthan Gum, Potassium Hydroxide, Phenoxyethanol, Ethylhexylglycerin. Own Anti-Aging Lifting Eye Cream. Is formulated to lift and smooth wrinkles while brightening skin with clinically proven CLA technology. CLA technology lifts and firms, restores and hydrates so your eyes can look as good as you feel. The Firming Silk Concentrate is a non-greasy and fast absorbing retinol-free anti-aging serum. It is formulated to firm and smooth your skin. The active ingredient is CLA (Conjugated Linoleic Acid). This serum is extremely gentle! After using it a few weeks, I am noticing that my skin seems more plump and smooth and my fine lines seem diminished. Also, this serum does not seem to be causing an extra breakouts. I can't really speak to this product's "firming" claims as my skin does not really have any "loss of firmness" issues. However, I can tell you that I am very pleased with the look and feel of my skin after using this product for a few weeks. I am really loving this serum! Wow, the ingredient list is extremely small. There are only 4 ingredients in this product. Yes, 4! I like the idea of a streamlined ingredients list for an anti-aging product. It is rare that you see that! Here they are: Caprylic/Capric Triglyceride, Coco-Caprylate, Conjugated Linoleic Acid*, Tocopherol. Own Firming Silk Concentrate retails for $24.99. I apply this serum in the evenings after cleansing my face. I apply it when my skin is still slightly damp. This allows the product to distribute and sink in better. This product can be used twice a day (I typically just use it 1x per day though). When I do use it in the mornings, I find that my makeup applies nicely after using this. I am extremely pleased with the Own Skin Health products that I tried out! I will continue to use and enjoy both the Own Firming Silk Concentrate and the Own Lifting Eye Cream in between other product testing! I love the simplicity of this line. Plus, it is nice to have good non-Retinol anti-aging skincare options while I am pregnant and/or nursing. 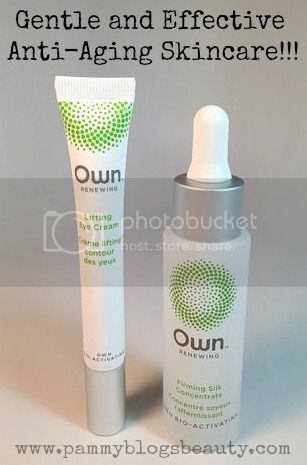 If you are looking for gentle non-retinol anti-aging skincare for an affordable price, be sure to check out Own Skincare! Be sure to visit Own Skin Health's website, Own Skincare on Facebook, and Own Skincare on twitter! Have you tried anything from this brand? How did you like it?